1 Fundación Ciencia para la Vida and Instituto MIFAB, Santiago, Chile. 2 Pontificia Universidad Católica de Chile, Santiago, Chile. 3 Universidad Andrés Bello, Santiago, Chile. Botrytis cinerea is a filamentous plant pathogen of a wide range of plant species, and its infection may cause enormous damage both during plant growth and in the post-harvest phase. We have constructed a cDNA library from an isolate of B. cinerea and have sequenced 11,482 expressed sequence tags that were assembled into 1,003 contigs sequences and 3,032 singletons. 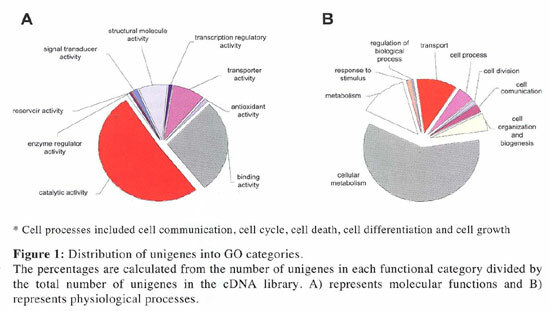 Approximately 81% of the unigenes showed significant similarity to genes coding for proteins with known functions: more than 50% of the sequences code for genes involved in cellular metabolism, 12% for transport of metabolites, and approximately 10% for cellular organization. Other functional categories include responses to biotic and abiotic stimuli, cell communication, cell homeostasis, and cell development. We carried out pair-wise comparisons with fungal databases to determine the B. cinerea unisequence set with relevant similarity to genes in other fungal pathogenic counterparts. Among the 4,035 non-redundant B. cinerea unigenes, 1,338 (23%) have significant homology with Fusarium verticillioides unigenes. Similar values were obtained for Saccharomyces cerevisiae and Aspergillus nidulans (22% and 24%, respectively). The lower percentages of homology were with Magnaporthe grisae and Neurospora crassa (13% and 19%, respectively). Several genes involved in putative and known fungal virulence and general pathogenicity were identified. The results provide important information for future research on this fungal pathogen. Key terms: Botrytis cinerea, cDNA sequencing, fungal pathogenicity. Botrytis cinerea, also known as "gray mold fungus," causes serious pre- and post-harvest diseases in at least two hundred plant species (Jarvis, 1977), including agriculturally important crops and harvested commodities, such as grapes, tomatoes, strawberries, cucumbers, bulb flowers, cut flowers and ornamental plants. The broad host range of B. cinerea results in great economic losses not only during growth but also during storage and transport of the products (Elad et al., 2004). In addition, B. cinerea strains have been shown to be highly variable genetically as well physiologically (Muñoz et al., 2002; Cotoras and Silva, 2005), and several strains have developed resistance to most of the fungicides used to control them (Latorre et al., 1994). Genome-wide analysis provides a new and powerful way of investigating fungal pathogens. The application of molecular genetic analysis to the study of other phytopathogenic fungi like as Magnaporthe grisae, Aspergillus nidulans and Fusarium oxysporum, has led to the identification of some of the genes involved in fungal pathogenicity (Idnurm and Howlett, 2001; Sweigard et al., 1998). These include genes involved in detoxification of antifungal compounds produced by plants (Straney and Van Etten, 1994), biosynthesis of phytotoxic compounds (Panaccione et al., 1992), breakdown of the host plant cuticle (Tonukari et al., 2000), conidiogenesis(Hamer and Givan, 1990), appressorium formation and function (Balhadère and Talbot 2001; Talbot et al., 1993), and amino acid metabolism (Balhadère et al., 1999), as well as those involved in conserved signaling pathways (Xu and Hamer, 1996). Several studies have dealt with the infection mechanisms of B. cinerea, with emphasis on microscopic and biochemical studies (Staples and Mayer, 1995) or molecular genetics (Prins et al., 2000). The application of molecular-genetic tools such as transformation (Hamada et al., 1994), differential gene expression analysis (Benito et al., 1996), gene cloning (van der Vlugt-Bergmans et al., 1997), and targeted mutagenesis (van Kan et al., 1997) have led to novel insights about the B. cinerea genes involved in the infection process. However, very little is known about spore adhesion and germination. The objective of this investigation is to generate an inventory of potential pathogenicity determinants via a ground-wide analysis of expressed sequence tags (ESTs) in B. cinerea. Such an inventory is indispensable for deepening our understanding of host-pathogen interactions and for suggesting candidate determinants that could aid in the design of novel antifungicides. Here, we describe the construction and analysis of an EST library from B. cinerea growing in culture. The data represents a substantial increase in available sequence information on B. cinerea expressed genes. Through the analysis of the ESTs, we also identified genes shown by others to be preferentially expressed during filamentous growth, putative virulence factors, signal transduction components, and secondary metabolism enzymes providing a solid framework for investigating the cellular events associated with pathogenicity. The Botrytis cinerea strain (A1) used was isolated from blueberry fruits and was maintained on malt-yeast extract agar medium (2% malt extract, 0.2% yeast extract, and 1.5% agar) at 23°C for five days. For longer periods, samples were stored in the form of spore suspensions in 20% glycerol at -80 °C. For this purpose, mycelia were removed from the culture plates by gently brushing the surfaces with a sterile platinum loop, suspended in distilled water, and filtered through two layers of gauze. The concentration of spores was determined using a Neubauer counter and a light microscope. B. cinerea A1 was grown in Erlenmeyer flasks containing 100 ml of malt-yeast extract liquid medium with 2x105 conidia/ml for four days at 23°C without shaking. Mycelia mats were harvested, washed, dried between sterile paper towels, and frozen. RNA was extracted from the frozen biomass by grinding with a pestle and mortar in liquid nitrogen. The resulting powder was suspended in lysis buffer and extracted following the method of Chang et al. (1993). The RNA was quantified spectrophotometrically and its integrity was evaluated by RT-PCR. Previous to PCR, cDNA synthesis was carried out by incubation of 3 µg of total RNA with random primers and MMLV reverse transcriptase (Promega) at 37ºC for 60 min. All reactions were conducted in a final volume of 25 ml containing 4 mM primers, 200 mM of each dNTP, 1.5 mM MgCl2, 10 ng of cDNA, and 1 unit of Taq DNA polymerase (Promega). PCR was performed using 1 ml cDNA template with 10 pmol of each PCR primer and 2 units of Taq polymerase (Promega). Reactions were performed in a PJ Research thermal cycler, and the amplified products (30 cycles) were analyzed on a 1.5% agarose gel in TAE buffer. Poly A+ mRNA was isolated using the Stratagene Poly A Quick mRNA isolation kit (Stratagene, La Jolla, California, USA). Unidirectional double-stranded cDNA was prepared from poly A+ RNA and cloned using the vector pExpress I (Agencourt Bioscience Corp.), exploiting the EcoRI and XhoI restriction sites. The cDNA libraries were not normalized, and no attempt was made to reduce the redundancy of highly expressed transcripts. The EST sequences are registered in the GenBank database under accession numbers EB801722-EB812785. The DNA sequence chromatograms were analyzed using the Phred software (Ewing et al., 1998) for base call and for estimation of error probability. All sequences were subjected to trimming process to remove ribosomal RNA, polyA tails, low-quality sequences, and vector and adapter regions. Sequences with 94% identity over 40 or more bases were assembled using CAP3 (Huang and Madan, 1999). The resulting contigs and singletons (unigenes) were compared to the protein non-redundant database using BlastX (Altschul et al., 1997) and analyzed with the InterProScan program (Zdobnov and Apweiler, 2001) to assign putative function. Gene ontology (GO) categories (Ashburner et al., 2000) were extracted from the best hits obtained from the BlastX comparison against SwissProt-Trembl database (e-value < e-15 and >70% of alignment coverage) and compared to the InterProScan GO catalog. All GO assignments were curated manually. To evaluate the number of orthologous genes present in the library, a BlastX was performed to compare the B. cinerea unigene set against selected fungal species. Candidate orthologs were defined as those with hits with e-values lower than e-15. The results were subsequently sorted and analyzed with specific Perl scripts. The titer of the cDNA library was 2.2x106 colony forming units/ml. This value was considered to be representative for the analysis of the genes expressed in mycelium (Liu and Yang, 2005; Trial et al., 2003). Blue/white plaque identification following plating of an aliquot of the library revealed 96% recombinant plaques. The quality of the library was assessed by examining the insert size of a few randomly selected recombinant plaques. The average insert size was 1.25 kb, and this representative value is similar to that of other libraries such as Trichoderma harzarium (Liu and Yang, 2005) and Gibberella zeae (Trial et al., 2003). EST sequences were produced from the cDNA library and scanned visually to confirm overall quality of peak shape and correspondence with base identification. After the cleaning process, the average length per EST of the remaining sequences (8,821) was 906 base pairs and the Phred quality value was larger than 20. The sequences were assembled into 1,003 contigs and 3,032 singletons (Table 1). Contigs were composed of multiple ESTs ranging from 2 to 229. The percentage of unigene sequences with similarity to GenBank database was 81%, a value similar to other fungal libraries reported in the literature (Nugent et al., 2004; Liu and Yang, 2005). The total number of unigenes was 4,035 corresponding to less than half of the total sequences obtained (Table 1). 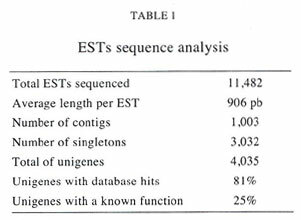 The ratio of sequenced ESTs to the number of unigenes is similar to that reported for other fungal EST libraries, such as Ustilago maydis and T. harzarium (Nugent et al., 2004; Lui and Yang, 2005). The sequences identified represent 4,035 putative genes expressed during mycelia growth, and if it is assumed that B. cinerea has a gene density similar to Neurospora crassa and M. grisae, this number of genes might represent more than one-third of all B. cinerea genes. The similarity of sequences present in the B. cinerea strain T4 library (Viaud et al., 2005) and ours was determined by assembling both libraries with the same parameters mentioned in the Materials and Methods section. From this analysis, a total of 1,841 contigs were obtained, from which 447 sequences were found only in the Viaud et al. library, 574 only from our library and 820 contigs produced by both sources. This analysis also produced 2,233 singletons from the library of Viaud et al. and 4,786 from ours. These results show the higher level of novel sequences provided by our work accounting for approximately 30% of the total unigenes set. The sum of the unique genes represented by both our library and that of Viaud et al. corresponds to more than half the gene content available for this microorganism. To determine the frequency of ESTs, a file containing contig identifiers was constructed indicating the number of ESTs per contig. High redundancy of a specific cDNA sequence among ESTs is likely to be correlated with a higher expression level of the corresponding gene. After cleaning for contaminating and low quality sequences, a total of 8,821 sequences were assembled. From the 5,789 ESTs contained in the contig sequences, we estimate a 65.6% redundancy in the library. The contigs containing the highest number of ESTs are listed in Table 2, and are considered highly expressed genes. The most frequently represented EST shows a 40.8% sequence identity to a hypothetical protein from M. grisae. 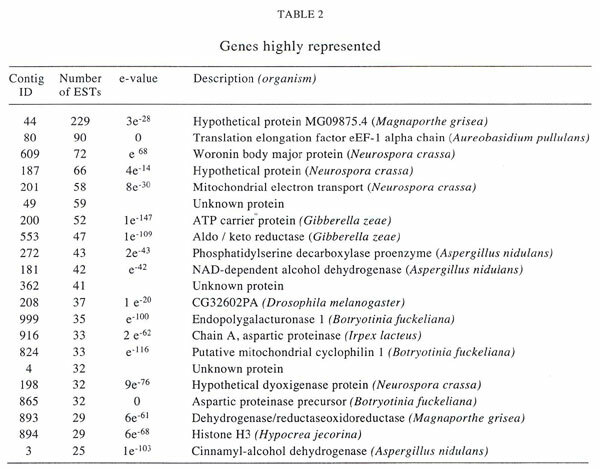 The next most frequently represented ESTs show significant similarity to genes involved in protein synthesis and energy metabolism, such as mitochondrial electron transport proteins, alcohol dehydrogenases, and Woronin body major protein (Table 2). Those genes are also highly represented in other fungal libraries (Liu and Yang, 2005; Ebbole et al., 2004). Another potentially highly expressed gene is polygalactouronase. This enzyme, involved in host cell wall degradation, has been shown to be essential for virulence (ten Have et al., 1998). Another highly expressed sequence is the elongation factor 1-alpha, which is related to protein synthesis in general. This activity is a critical function, allowing differentiation in response to a physiological requirement. The Woronin body major protein precursor has been proposed to be a fundamental factor in the hyphal growth and pathogenicity process (Soundararajan et al., 2004), thus its presence in the library and expression at high levels is not a surprise. The ADP-ATP translocase gene is highly expressed. This gene also was found highly expressed in T. harzarium and M. grisae (Liu and Yang, 2005; Ebbole et al., 2004). ESTs were assigned putative functions according to GO categories. All identified ESTs were categorized into molecular function (Figure 1A) and physiological processes (Figure 1B), respectively. In terms of molecular functions, the sequences exhibit similarity to a broad diversity of proteins involved in binding activity (27.3%), catalytic activity (51.3%), transporter (8.6%), and structural activity (7.9%). In terms of physiological processes, the sequences obtained were classified in several groups having significant matches to proteins with known functions. The most represented ESTs correspond to cellular metabolism (60.8%), transport (11.8%), and cell organization and biogenesis (5.2%). Using this information, preliminary models for glycolisis, pyruvate, sucrose, and starch metabolism were constructed. We also found all the genes necessary for mitochondrial electron chain and ATP synthesis. Other pathways related to secondary metabolism and signal transduction were reconstructed only in part (results not shown). 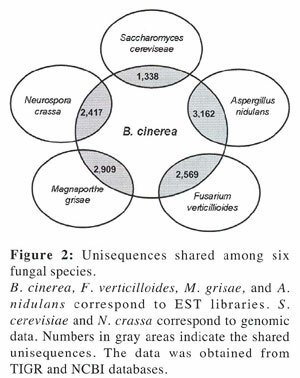 Pair-wise comparisons with fungal databases were carried out to determine the B. cinerea unique set of ESTs with sequences similar to genes in other fungi including M. grisae, A. nidulans, N. crassa, Saccharomyces cerevisiae, and Fusarium verticillioides (Figure 2). Among 4,035 non-redundant B. cinerea unigenes, 1,338 (23%) sequences had similarity with F. verticillioides and 22% and 24% with S. cerevisiae and A. nidulans, respectively. Lower percentages of homology were to M. grisae and N. crassa (13% and 19%, respectively). The most frequent GO categories present in the shared sequences are those related to cell components. Among the biological process category, the more frequently shared sequences correspond to GTP binding proteins, ABC transporters, serine/threonine protein kinases, and heat-shock proteins. This result is similar to that reported previously (Austin et al., 2004). ESTs were examined for genes with similarity to known fungal virulence or pathogenicity factors. Twenty virulence/pathogenicity genes were identified (Table 3). Among those, three are significantly similar to known virulence factor genes in the human pathogen Candida albicans, including phr1 and cpy1, which are involved in yeast-to-hyphae or yeast-to-pseudohyphae transition (Mukhtar et al., 1992; Saporito-Irwin et al., 1995). Phr1 encodes glycosylphosphatidylinositol-anchored proteins, whereas the third gene, sap2, is related to penetration and also is involved in adherence to epithelial cells (Zaugg et al., 2001). In addition, sequences with similarity to pathogenicity genes from M. grisae, such as gas1, pmk1, and pth2, were detected. The first two are related to appressorium formation and penetration in this fungus. Deletion mutants of gas1 had normal growth and conidiation and formed normal appressoria but were reduced in appressorial penetration and lesion formation (Xue et al., 2002). PMK1 exhibits similarity to several MAP kinases that have been described in M. grisea, such as OSM1 (Hog1) and MPS1 (Slt2) (Xu, 2000). Only PMK1 appears to be involved in pathogenicity of M. grisea, since pmk1 mutants are impaired in appressorial formation, penetration, and invasive growth. 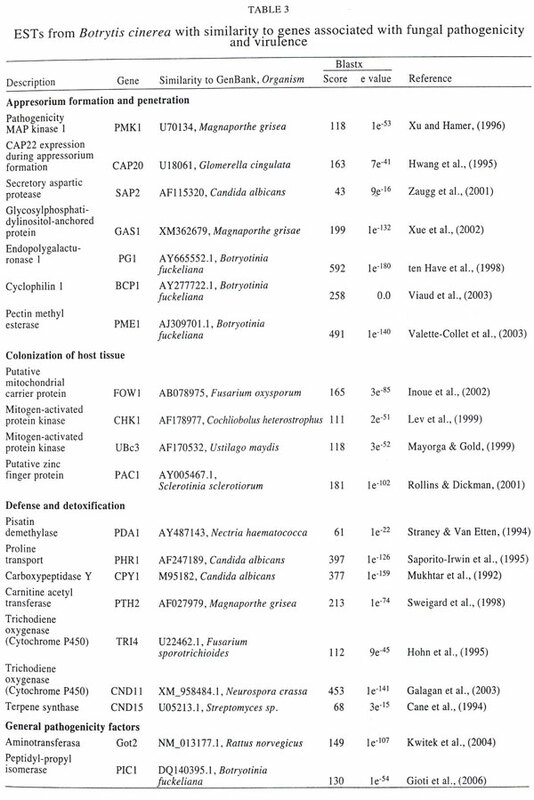 PMK1 orthologs have been identified in many fungi and have been shown to be essential for the infection process in several foliar pathogens, such as Cochliobolus heterostrophus, Colletotrichum lagenarium, and Pyrenophora teres (Lev et al., 1999; Takano et al., 2000; Ruiz-Roldan et al., 2001). Another gene, path2, that encodes an ortholog of a gene encoding carnitine acetyltranferase, an enzyme required for activated fatty acids to transverse the mitochondrial membrane for oxidation (Sweigard et al., 1998). Another pathogenicity gene present in the library is fow1, which potentially encodes a mitochondrial carrier protein in F. oxysporum (Inoue et al., 2002). Mutants of fow1 have normal growth and conidiation in culture but are defective in colonizing plant tissues and causing disease. Interestingly, several pathogenicity genes are involved in the defense and detoxification in different fungi. The production of toxic substances that weaken or kill plant cells in advance of the growing hyphae is a common phenomenon in plant pathogenic fungi. A sequence with similarity to tri4 from Fusarium sporotrichioides that encodes a cytochrome P450 monooxygenase involved in the trichothecene biosynthesis was detected. This enzyme is required specifically for colonization in plant tissue and detoxification (Hohn et al.,1995). The gene also exhibits similarity to cnd11 from N. crassa and cnd15 from Streptomyces sp. and, therefore, could be involved in sesquiterpene biosynthesis (Cane et al., 1994). The family of sesquiterpenes epoxides inhibit eukaryotic protein synthesis and are major contaminants in crops, producing acute toxicity in humans and domesticated animals upon consumption (Hohn et al., 1995). CND genes from B. cinerea (cnd11 and cnd5) have been shown to present similarity with tri4, suggesting that they could be organized in a physical cluster and be involved in secondary metabolism (Viaud et al., 2003). Also interesting are CAP genes, which are expressed in appressoria and during host invasion in Colletotrichum gloeosporioides (Hwang et al., 1995). Two of these peptides (CAP20 and CAP22) show similarity to cell wall proteins and may be part of the appressoria wall. Deletion mutants of cap20 are non-pathogenic, while mutations in some other CAP genes had no effect on pathogenicity (Hwang et al., 1995). Since mutations of cap20 affect processes other than disease, their role in pathogenesis requires further examination. Interestingly, pda1, a gene potentially involved in protection against antifungal phytochemicals, was detected. Fungi possess a vast array of transporters that mediate secretion and import of a variety of compounds. The majority of transporters contribute to cellular homeostasis, however, some are thought to specifically function during plant infection. pda1 participates in detoxification of the pea phytoalexin pisatin. Disruption of pda1 had only a slight effect on pathogenicity of Nectria haematococca in pea plants, but transformation of isolates lacking the entire dispensable chromosome with three PEP genes (pep1, pep2, and pep5) increased their pathogenicity (Han et al., 2001). B. cinerea produces cell wall degrading enzymes (CWDEs) that facilitate in planta growth and provide nutrients to the invader by breaking down the plant cell wall (ten Have et al., 2001). An endopolygalacturonase, characterized as a virulence factor, is present in our library and appears to be highly expressed (35 ESTs). This result in consistent with the expression studies of ten Have et al. (2001), which conclude that this gene has a very high basal level of expression in different media and host plants. In contrast, pectin methyl esterase (Bcpme) genes have a more complex expression regulation with inductions by galacturonic acid or low ambient pH. Valette-Collet et al. (2003) described the expression of Bcpme1 in different conditions and constructed a mutant to measure the effects of its loss of activity in the ability of B. cinerea to invade several host plants. Additional pathogenic putative genes present in the B. cinerea cDNA library are bcp1 and pic1. bcp1 encodes cyclophilin A, which is known to interact with calcineurin and to be a virulence determinant in M. grisae (Viaud et al., 2002). pic1 is highly expressed during fungus-plant interaction and might be important for pathogenicity (Goiti et al., 2006). In conclusion, this work provides an important inventory of B. cinerea genes, which will be crucial for future studies of the cellular events related to host-pathogen interactions. We thank support from the Microsoft Sponsored Research program and Bernardita Méndez for helpful comments on the manuscript.